The Cost Apparel is proud to announce its new Classic The Cost Apparel Polo. 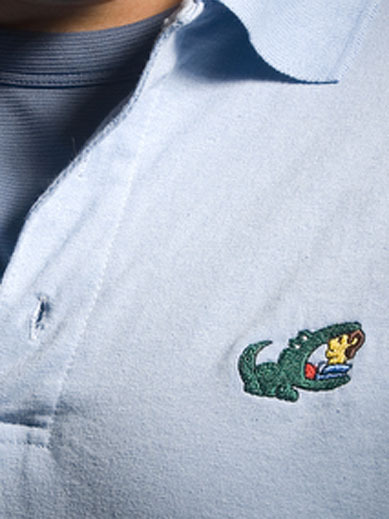 Fashioned from a 50/50 cotton/poly blend and sporting the original The Cost Apparel logo this polo attempts to put an end to the brand name game. This is the anti-brand, a company that is fighting to Take back the polo . While other brands may try to target their customers with images of celebrities, athletes and bare-chested models, The Cost Apparel markets their apparel with satire and a sense of humor. Just visit their website (www.thecostapparel.com) and you'll find a number of videos from Elton John singing Crocodile Rock with the Muppets to a cheesy 1990's water toy commercial entitled Crocodile Mile . Forget Abercrombie. Forget the frat scene. Forget layered popped collars. Take back the Polo! The Cost Apparel was first conceived in the summer of 2005 and finally actualized on one evening in the summer of 2007. The Cost Apparel took its name from a rough translation of a designer brand polo. This is its goal, to provide a rough translation of a quality designer polo at a fraction of the cost without compromising quality and style. The Cost Apparel is currently located in beautiful Burlington, VT and is owned and operated by Jason Weaderhorn.